I think she may be coming back. As people said she is the 2nd most popular female( and 2nd most popular fire emblem character based on the heroes poll), FE:W, was pushed to have her in by intelligence, and she does have new abilities presented ever since smash ala brave lucina(also she has had a bow in all the games post of smash bros). From the way i see it, she has enough resources to pull to make her own character, and sakurai and his team could have had time to make her come back thanks to the polls. Personally, I hope they just have her share a slot with Marth as alt skins. Similar to Little Mac how he got 8 wire frame and 8 regular skins. Just give 8 math skins and 8 Lucina skins. That way she stays in the game, and we don't have to worry about people complaining "why are there so many Fire Emblem characters taking up slots!" Honestly, if they are a different character, I would want them to have a seperate slot, If there's already effort put in to have her voiced and have seperate palletes, its not much more more to have an extra box on the screen, plus when it comes to classic and all star mode I would like her to appear. Getting a Marth trophy instead of a Lucina trophy in the respected modes would be a step down from smash 4. Making her an alternate costume, I don't believe would free up that much more time to make a postive difference. If Lucina stays a clone, I kinda wanna see something like EX characters in the older King of Fighters games - some characters had alternate versions that, rather than having separate slots on the character select screen, had "hidden" slots that could be accessed by selecting the base character while holding a certain button, usually start or select. So, for instance, in KoF XIII, if you select Takuma Sakazaki normally, he just has his normal moveset. If you press start while hovering over him, he's replaced with his alter ego, Mr. Karate, who has a different moveset. I don't really see why Lucina would be cut at this point. She is the second most popular female FE character according to an official international poll. Her game (Awakening) coincided with the marketing and innovation that saved the franchise, making it something very noteworthy of representation. She's already been in Smash. Her inclusion was so unbelievably easy as a clone character, it barely took any work resources and balancing wise; her being a clone with the difference of sword sweet spots fills a niche of an "easy mode" Marth. Plus, more girls from Fire Emblem (not like Camilla though). Corrin and Robin kind of balance this out, but their designs were made to be so gender-neutral it's not that significant. Lucina's alts represent other females from the franchise and she's written as a daughter of Chrom, not some avatar. Basically, having Lucina pretty much doesn't detract from other character entries at all while she offers benefits from both representation and gameplay perspectives. Oh please god yes, keep 'waifus' outta my Smash please. Give me Lyn, Celica, Eirika or Micaiah. Actually give me Anna so we can finally get some different clases in here. Just...please no waifu bait or loli's, they're genuinely turning me off the series. I'm thinking Corrin being on the default roster and Lucina getting at least SSB4 Roy levels of decloning would probably be good FE representation without drafting in the guy/girl/avatar from the Switch game before they proven themselves. Question is, how do you delone Lucina? While I'd prefer for Lucina to become "EX Marth," I'd probably take the same approach that a lot of fighting games take while differentiating shotoclones - especially since games like Icons and Rivals of Aether are kinda turning "tipper swordfighter" into the shotoclone of the platform fighter genre. So how do traditional fighters differentiate shotoclones? By emphasizing different aspects of their kit to give them a different gameplan. It's typical to have two all-around ones - one aggressive and the other defensive - and then have any extra ones past that pushed more towards extremes with altered overall character properties like health, size, etc. Roy kinda fits that role in Smash - his sweetspots are up close and he's a fast-faller rather than a semi-floaty. This raises the question of how we specialize Lucina in a slightly more aggressive direction, and what aspects of her and Marth's shared kit should be emphasized for her, and de-emphasized for him, and feels like it fits her as a character? 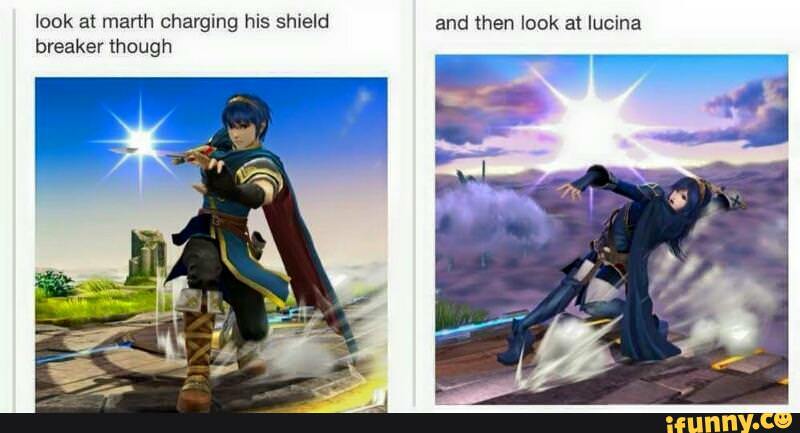 Personally, considering the difference in their posture while charging shield breaker (Marth's more elegant posture vs. Lucina's complete lack of chill) and the key differences in their backstories backstories in their home games and the circumstances behind them entering the main conflicts of their games, I'd definitely emphasize the idea that Lucina's fighting style is less refined and that she has poor form. Maybe take come cues from Forsburn and Clairen in Rivals of Aether. The biggest change I'd suggest is either changing the way Dancing Blade works and what it's used for, or even replacing it entirely. I'd also consider maybe changing the way her counter works - possibly something more Focus Attack-esque? Or just making the Iai Counter custom from Smash 4 the default. Bows, lances, her animations in Awakening, even some Warriors moves perhaps (even if that moveset is largely based on Chrom). Or, you know, you could take reference from Fire Emblem games. I'll admit that I'm approaching this more as a systems wonk than as a fire emblem fan, but there's this concept in moveset design of character integrity - i.e. that a character in a fighting game is very closely associated with the actual mechanics and utility of their moveset and the gameplan it enables - or, as Combofiend put it in a certain infamous interview, their function. You usually have wiggle room to change - you can emphasize and de-emphasize certain aspects, change some moves, or even replace some moves entirely, but the broad strokes of their function should remain fairly consistent - just gutting everything and start over from scratch will alienate people, even if you can fully justify it in terms of lore and/or you have other characters with similar functions, because of how closely a character's fluff (i.e. their appearance, personality, backstory, and other miscellaneous lore) is tied to their function in general audience's minds. Even if you were to give Lucina a more game-accurate moveset, there's still the issue of keeping her function relatively intact. Why? Marth handles that function better according to most. Give her a new function. Besides, Smash isn't an ordinary fighter. It's not just a traditional fighter thing. The same concept applies to RPG classes, characters in a MOBA or class-based shooter, even guns in a first person shooter. Aesthetics and gameplay associated with a given option are very closely emphasized in people's minds, and suddenly deciding to completely change the gameplay associated with a certain set of aesthetics (or the aesthetics associated with that gameplay like Marvel vs. Capcom Infinite did) throws people for a loop in a way generally feels... wrong, for a lack of a better way of putting it. And while Lucina has a similar function to Marth, she doesn't quite have the exact same one, and as I mentioned in my previous post, you can tweak a function by replacing one or two options or emphasizing or de-emphasizing certain aspects of a character - look at Ken's gradual shift towards a more rushdown playstyle in Street Fighter. And you also have to consider the fact that not everyone who plays Smash or even mains Lucina is a Fire Emblem fan. There are plenty of people who just main Lucina because of her playstyle and don't care about Fire Emblem. While I agree that Lucina could use more stuff taken from her home games, I think that giving her a completely different gameplay niche just for the sake of game accuracy is not the right way to go about it. I say make her accurate first. That's kind of like saying don't change Ganondorf because he has a role. Sure, but it's not accurate to who he is. Lucina being a Marth clone doesn't always give fans the right impression of who she is, and I want her to finally be accurately portrayed. Or at least more accurately. Maybe as a costume. Really, that's something I hope Smash Switch does more of. Costumes. Series with revolving casts (Pokemon, Fire Emblem, now even Xenoblade) who have large numbers of characters, receive cuts as to not have the roster over run with their characters. Sakurai has said comments to this regard in the past. No stress. If you want to believe we are going to have more Fire Emblem characters than any other series, go ahead believing that; I'm sure it will be a rewarding thought process. I, personally, do not believe it is fact or opinion. We just have precedent that leans toward "cuts will happen." Albeit, you have to understand why each character was cut. While "revolving door" is definitely one of the reasons, it is not the primary reason, however. And we have no precedent regarding Xenoblade, though, I have to admit, I genuinely believe Monado boy is going to take the plunge. So, to that end, Fire Emblem could still have cuts AND have more representatives than any other series. It just depends how it plays out, really. I mean... honestly, I think that even Ganondorf were to be made more game-accurate, it should be done in a way that retains or even reinforces his existing gameplay niche - look at how Project M gave him the cape flip reflector. It gave him something more accurate to his home games while not only retaining his existing gameplay niche of a heavy grappler, but reinforcing it by giving him an anti-projectile move, something of a staple of grapplers in traditional fighting games. And when I say retaining Lucina's gameplay niche, I don't mean having her stay a straight-up Marth clone. I mean in the more abstract sense of her being a decently versatile close to mid-range character with strong, disjointed pokes within her effective range, as well as strong reversal options in the form of quick aerials and a DP-style up-special. I still think you're being too rigid. Which, to be fair, is a sentiment that could be applied to any aspect of Smash at all, rendering any discussion moot. So we have to take what we have been given and apply it as best as possible. Or disregard anything that would be considered "evidence" in a game where none of our discussions matter anyway. How does that render discussion moot? The opposite would be true. If we were solely dealing in facts, there would be no alternative perspectives. You just used your speculative 'objective facts' to try to shut down discussion in the first place. How is his the 'limiting' sentiment? hmm I think Lucina is accurately represented at Smash 4. Being someone that impersonates Marth and uses the same weapon as him, it makes sense to make her a Marth costume that became a clone. So... Because she dresses up as Marth, it makes sense that she would fight like Marth... Despite literally having the distinct style of her father. Her clothes gave her the ability to mimic an ancient heroes techniques. Seems legit. ...She's trying to be Marth and ends up in a weird cross dimensional thing universe where she can fight alongside or with him, why wouldn't she be more similar? I'm just saying it makes a lot of sense, and whether she needs to be decloned or whether she serves a good purpose as a non-tipper Marth is arguable but there's no more 'canon' logic to the idea that she needs to be her own than there is that she needs to be like Marth. Yes, there literally is... Play the game? The argument needs to be "canon is irrelevant" in order for you to make a point. Because, canonically, there is much more of an argument that she fights not like Marth, but Chrom. Maybe because they never met while she was learning the sword? Why can't she learn now? Maybe that's why she doesn't have access to the secret tipper technique, she's just managed to get the basic strokes mastered. I mean seriouisly, canonically this **** doesn't make sense anyway, but if she's trying to pretend to be Marth then it makes sense for her to carry over that theme to Smash. Whether or not she's a character who deserves otherwise I'm not going to bother commenting on but why the hell does 'she never actually learned from Marth they were born 100s of years apart it makes no sense for her to be using his style when she couldn't have learned from him' matter when we're talking about a game where they're figures for master hand to play with. Sure, argue to have her represented with more variation, make her different if you think that's what she deserves, but 'canonically' doesn't mean anything. If you ignore character's canon abilities, you end up with stuff like Ganondorf who is grossly misrepresented. Right, so say that. Tell people what Lucina is missing when she's forced to use Marth's moveset, don't spout canon nonsense about how it doesn't make sense. I fully embrace the idea of decloning Lucina, she's and incredibly strong female character who presents possibilities of to include many different weapon sets from the games. BUT I think it'd equally important to recognise her character, and her identity as a 'masked Marth imitator'. While not necessarily being a full clone of Marth it makes sense for her to have some references to his moveset. What you're currently arguing isn't "I wish Ganondorf would draw inspiration from his games", it's "Ganon doesn't actually use his double swords and trident in the same game so it makes no sense for them to be in the same moveset". See, that's another thing. Being a Marth clone causes the misconception that she's just female Marth when she isn't. You say recognize her character, but do you even know what that is? Besides, Lucina didn't even know what Marth was actually like. Any attempt to emulate him would have been flawed at best. She took his name to inspire her people and later disguised herself (wording, logic, and the fact that in the Future Past DLC she was undisguised would seem to indicate that she did not disguise herself until leaving her world) to keep her identity a secret (a bit overkill if you ask me as well as my least favorite part of her character). Why and how is that a basis for her fighting like her ancestor millennium removed? Smash also butchers her character by making her so irreverent. Lucina would not sass Marth any sooner than she would sass Chrom. The only real basis for saying they fight the same is that the phantom Marths in Awakening fight like her and maybe the Fates amiibo characters, but that's because they are based on the short hair Lucina model, but those were fake Marths in bonus content where they didn't bother (understandably) to make new assets (aside from maybe the glow effect) for the legacy character who were mostly made in the avatar system. It is also important to note that they do not fight like Marth does in Smash. Fates Amiibo characters I think had them fight the same, but given the nature of the game, they probably fought more like Lucina than Marth. Regardless, that was post Smash. I want an accurate Lucina. Is that so hard? In Fire Emblem Warriors, Lucina and Chrom have cloned movesets. Why? Mostly because Intelligent Systems had Koei Tecmo add her late because she was so popular. But it's also because Lucina pretty much got her fighting style from Chrom. The only problem that I have with decloning Lucina to not play like Marth is that it would take up development time. Lucina as a clone is convenient because while she's in the game while not taking development resources away from other characters and features. She wasn't added too late since she was apparently the templet for clones in Warriors. I do think they could have done more with her in Warriors. When it came to her inclusion in Warriors, I think the decision wasn't done that late. Being added late in Fire Emblem Warriors would be Lyn and Celica who are in the roster without being DLC, but have no presence in the main story. Ideally, I would want her decloned but I'll take Lucina as a returning clone. No, because she dresses up as Marth, calls herself Marth, weilds Marth's sword, is the same class as Marth, is a descendant of Marth, and is mistaken for Marth by someone who knew him for years. There's far more than aesthetic similarity, so yes, it makes sense that she would fight like Marth. All lords fight the same? News to me. I guess all I need to do to fight like Marth is dress up as him, call myself Marth and order me a Falchion. Eh? Or does it only work if I am actually related to them? Nice logic, it is totally sound. You should present it to someone you know in real life so that they think lesser of you. She dressed up to hide her identity, she took the name to inspire her people, using the same sword does not mean you would fight the same (look at Chrom), guess that would also mean that Ike, Chrom, Roy, Eliwood, and Hector all fight like Marth too, Chrom is a descendant of him too but doesn't fight like him (neither do Lissa or Owain), Tiki also said male Robin resembles Marth and resembling someone doesn't mean you fight or act like them. I do sort of wonder which direction Sakurai will steer the ship this time in roster building. Ice Climbers are most certainly back. He's a many of many quotes too - in one instance saying that he dislikes cutting characters but also saying that there were too many FE characters for his taste. There does have to be a pretty good reasoning for being cut though. He hasn't even cut characters that were transformations, simply divided the transformations. Retained at least one character from Pokemon Trainer. Heck, he's even brought back Dr. Mario after being gone in Brawl. It's likely Lucina is here to stay and this upcoming game will tell us what she'll be doing for the long haul. I like her character, design and used her quite a bit in Smash 4. Sometimes with characters like this, they get some fine tuning while retaining the same qualities. Something that will tell us a lot is what kind of gimmick Sakurai is going to use in this game. If this thread is actually going to continue to be more pages of 'Canonically it makes no sense fo her to know Marth's moves' then I don't see the point of staying up to date with it. Lucina is an awesome and unique character, who also has a greater connection to Marth in the eyes of the player than just about any other Lord before her. There's plenty of logic to giving her a new unique moveset, she's popular enough to be her own character. There's also enough logic to keep her as a clone, there's a connection within her character for her to maquerade as Marth in Smash as she did in Awakening, and Sakurai introduced the gameplay aspect of a tipperless Marth which actually had value to the game, being preferred in certain matchups where tippers were impractical or the consistent power was more valuable. But if I have to read 'lol, you think that she'd actually fight like Marth in the real world', let alone getting actually ****ing aggressive with it then I'm out and yeah yeah nothing of value was lost yadda yadda No, there's nothing wrong with wanting something unique but if you're calling people stupid because they see logic to justify her being a clone then you've stopped caring about discussion and just want to be right. Serioiusly, who the **** bring real world logic into a discussion of ****ing video game mechanics, especially one where a space suit is fighting a clumsy civilian, and the clumsy civilian is the higher tier fighter. But if she doesn't fight like him, how does a masquerade equal reason enough to be a clone? Enlighten me to how that works. Besides, I think it hurts her character and that may be the worst of it. How many people just assume she's girl Marth because of Smash? Because Smash doesn't have a story or character progression, it's had a total of one 'plot' across 4 games. The only way to illustrate, within a fighting game, that someone is pretending to be another person is to have them fight like that person, since that's pretty much the only expression of character in the game. There's taunts, entry and winning animations and sound clips to go alongside the moves that you use. Everything else has to be demonstrated by how they fight. So if she's masquerading as him, then she's a clone in some way. And I think that's a fair point. She does more than that in her game and nobody can fault you for wanting to see her be more than just 'Masked Marth'. BUT if someone else thinks that her position as Masked Marth is a significant part of her in the story then have that discussion, stop bringing it back to 'how would she even be able to mimic her acestor one millenium removed', ask IS, they had her do it.